We are Manufacturer, Supplier & Exporter of Feeders For Animal, Poultry, Cattle Feed Plants and our setup is situated in Miraj, Sangli, Maharashtra, India. 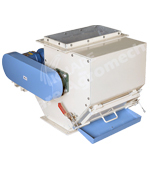 In any animal feed plant, fertilizer plant & bio mass plant feeders play vital role to feed raw material in controlled form to machines like Hammer mills, pellet mills, Counter flow coolers, Auto batching systems, Auto bagging systems & crumblers etc. 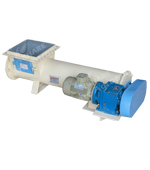 We manufacture different types of feeders like belt feeders, screw feeders, gravity feeders, air locks, rotary vane feeders etc. These feeders are controlled by variable frequency drives ( VFD ).